Æquo. Can't wrap yourself around the spelling (pronounced ekwo)? Perhaps lead your horse to water. Combine aqua with equus. Add audio. Voilà, a new Dutch speaker house. They had their coming-out party in a ground-floor cubicle of the Munich 2016 HighEnd show. I'd briefly profiled them in an April 2016 feature, then thrown my chit into their review pot. Concept plus execution equaled perfect sense to me on pure sight. I like compact high-performance speakers which look good. A month later, senior contributors Marja & Henk visited Æquo in Munich. This led to first impressions in their cherry-picked event coverage. Now we had three floating chits in our water trough, one potential horse's head in a bloody bed. I ran our joint interest past the folks in Eindhoven. They suggested a delayed two-prong approach. I'd follow up my original intro with a formal review covering background, personnel and tech. Then our Dutchies would furnish a second opinion on just sound a few months down the road. Former contributor Wojciech Pacuła was leader of our parade with his review on highfidelity.pl where Æquo's very first distributor who'd been signed up in Munich had available a very early pair in Warsaw. As they did for their importer and first reviewer, Æquo's concept manager Ivo Sparidaens and PR man Paul Rassin would accompany my loaners to render on-site personal introductions in Ireland. They were primed to answer any questions I might have. Time to be curious. 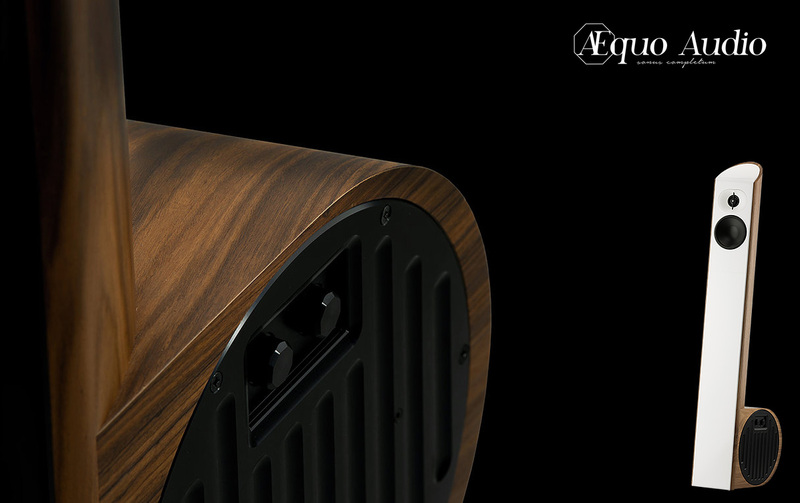 To start with the obvious, the Æquo Ensis is a compact tower. Its slender two-way 16cm narrow stalk with popular boat-hull back is driven through a laterally flared active bass bin. The sidefiring woofer is backed by 500-watt nCore amplification. Its fine-tuned with amplitude/compensation knobs on the side with scalloped heat sinks. A closer look reveals an oval waveguide around the soft-dome tweeter. Its phase plug floats physically separated in front of it on a vertical shaft*. The low-diffraction rear-slanted baffle and sealed loading suggest attention to the time domain for minimized group delay. Floor-coupled bass promises effective loading to avoid the inevitable floor bounce of high-placed bass drivers. A choice of small drivers indicates a love of speed whilst the narrow face promises mini-monitor type soundstaging. * Actually... "though it seems like the plug floats, a tapered cone (pseudo sphere) on its back side carefully follows the contour of the dome to press on its middle. This pressure is applied with tension in the carbon rod which is very slightly bent for the right pressure. Carbon is the perfect material because its stiffness allows high pressure from only the slightest bend which won't fatigue over time to lose tension.The dome's membrane is kept solidly in position between a small back plate in the middle of the tweeter's voice coil and this back side of the cone. A slightly inward position creates a better ring-like dome without any of the resonance associated with a normal full dome (even a centre-fixed dome as you see now with certain brands). The tension of the rod further damps any resonance or vibrational movement difference between the fixing point directly connected to the motor and the rest of the tweeter system." At €20'000/pr starting, our aqueous equine plays unapologetic favourite stallion in the sultan's private stable. That means, out of the gate, being priced for the high end; and hopefully first across the finish line to win the race across the desert of today's too many me-too speaker choices. As to name, during the Roman empire an ensis was a two-sided long sword. Here cutting two ways probably wasn't the intended meaning. Bloody keen is more likely as in, dressed to kill and sonically sharp to match. The specs mate 25kg to dims of 116 x 31 x 29cm and a claimed response of 10-40'000Hz at 90dB sensitivity for the passive drivers, with a friendly 8Ω nominal impedance. The tweeter is a ring radiator-type soft dome with dual copper caps, its phase plug an aluminium bullet on a carbon-fibre rod. The midrange is a custom AudioTechnology unit with a polypropylene blend and Hexacon voice coil on a Kapton/aluminium former. Like the tweeter's, its motor is described as fully symmetrical. The 10" woofer's aluminium cone with large rubber roll surround claims 5cm of linear Xmax in a symmetrical magnetic field. The passive crossover is "balanced and in phase consisting of high-end caps and coils but no series caps on the midrange". The baffle and top insert are a mineral-filled polymer with granite-type mass/stiffness available in white or black. The tweeter lens is the same synthetic stone as the baffle. The remainder of the cabinet is finished in various lacquers or real-wood veneers. Inside the enclosure, four different wood species make up various braces and reinforcements. A performance option are silver crossover parts (caps, coils, wiring and solder) and silver terminals. Signal processing on the powered woofer occurs purely in the analog domain. Speaker terminals are WBT, the power inlet is a Neutrik PowerCon. 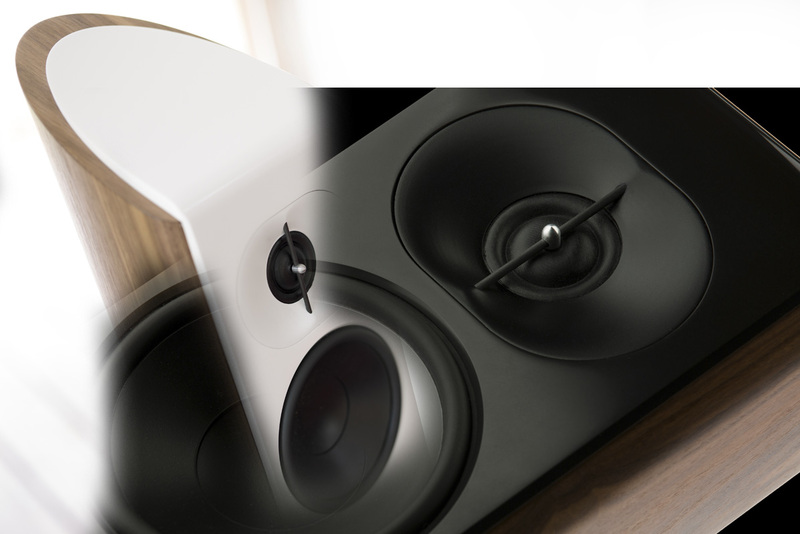 "The step response shows drivers in positive polarity and how they are very well aligned by the sloped cabinet and specific depth of the acoustic tweeter lens. By feeding a DC signal, we see how the drivers rise up. The tweeter's faster decay creates a bump in the top of the rise. It is not coming up faster than it should but arrives at the top amplitude of the rest of the system. This explains why we add no harshness due to premature tweeter attack; and why there is such perfect imaging of wide frequency instruments. "We can also see the very low sine wave forming opposite the DC signal (everything below zero dB which wasn't in the test pulse and shouldn’t be in the playback signal of the drivers) and how fast the signal returns to the base line. These are signs of not only perfect time alignment but very fast, precise and well-damped signal reproduction. Especially the tweeter proves totally free of ringing since only one bump is created in the response of the system instead of many decaying ones in a row. This is clearly audible. This speaker keeps everything taut and open and does not 'fill up' the music. Good resolution is the result. "The most obvious part of the tweeter is EHDL™ or our Enhanced Horizontal Dispersion Lens. It changes the balance between horizontal and vertical dispersion back into something more comparable and compatible with the relative dimensions of concert halls and studios as well as living rooms. As your room is probably wider than the distance from floor to ceiling, its redistribution of vertical into horizontal energy will allow a much more realistic soundstage whilst removing the abundance of especially floor reflections normally spoiling the holographic effect. 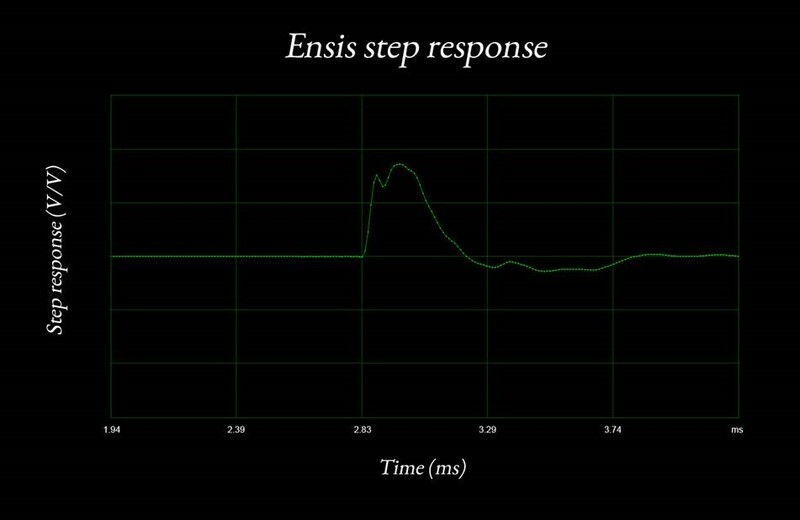 For our Ensis tweeter, the goal was to have it play clean at much lower frequencies than usual; to use low-order filters; and have the smaller fastest driver play a bigger part of the bandwidth for better resolution and dispersion. Additionally the EHDL™ adds lower bandwidth. To keep sensitivity as high as possible and impedance at 8 ohms for the +90dB target, we saved weight by not winding the voice coil with solid copper but with a wire of aluminium core and copper cladding which is stronger and more conductive than aluminium but much lighter than copper. The sensitivity and dispersion pattern of the tweeter is now comparable to some of the best ribbons but can be placed closer to the midrange and has none of the distortion problems associated with ribbons which make them pretty unsuitable for low-order crossover slopes at lower filter frequencies without getting harsh or of enormous size. This tweeter system needed a superior motor. We tested different Neodymium and ferrite magnets as well as asymmetrical and symmetrical designs. The symmetrical motor concept with dual copper caps had clear resolution advantages and increased upper frequency bandwidth whilst the best low-frequency behaviour was reached with a ferrite motor and larger compression chamber (also balanced so that makes two). Finally we selected a fully symmetrical ferrite-based motor."